Antibiotics in animal agriculture – what’s the latest? Back in my days working with the Union of Concerned Scientists (UCS), I was highly tuned in to the issue of antibiotic use in animal agriculture. In short, the majority of antibiotics produced in the United States are used for livestock, and not just as a treatment for sick animals, but as a low-dose feed additive to help them gain weight. In 2007, I helped organize two Hill briefings on the Preservation of Antibiotics for Medical Treatment Act (PAMTA), which sought to ban non-therapeutic use of medically important antibiotics in raising animals for food. PAMTA was reintroduced by Louise Slaughter (the resident microbiologist in Congress) in May 2013 and holds the support of over 450 organizations, including the American Medical Association, the World Health Organization, and the National Academy of Sciences. 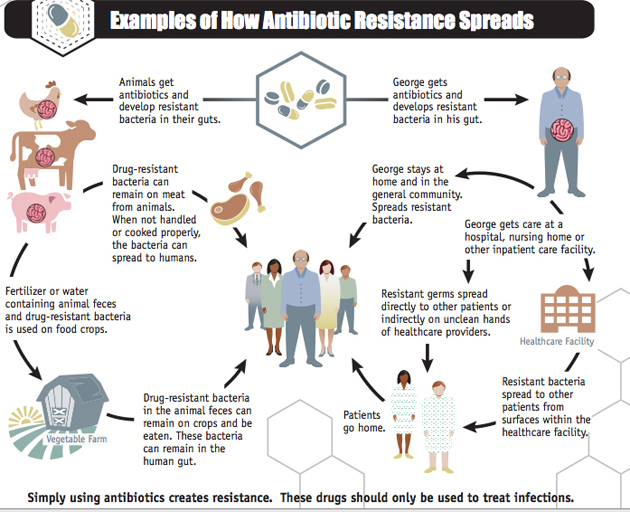 Basically, everyone in the medical field agrees that antibiotic resistance is a major public health issue and that overuse of key antibiotics in livestock contributes to a loss of effectiveness for human use. I haven’t kept very close track of the issue in recent years, but I was happy to see it gaining traction in the latter half of 2013. Even moreso, I was thrilled that my friend and Tufts Friedman School classmate Dawn Undurraga had the opportunity to appear in an “Animal Antibiotic Debate” on the daytime talk show The Doctors. Dawn also co-authored an Environmental Working Group report titled Superbugs Invade American Supermarkets, which demonstrates unsettling levels of antibiotic-resistance bacteria in supermarket meat. FDA’s guidance documents, including this guidance, do not establish legally enforceable responsibilities. Instead, guidances describe the FDA’s current thinking on a topic and should be viewed only as recommendations, unless specific regulatory or statutory requirements are cited. In other words, the livestock and pharmaceutical industries have no legal incentive to comply (although many companies have already indicated that they will take the voluntary measures). Some groups are worried that FDA’s guidance document will ultimately make the situation worse, as it will serve as a diversion from PAMTA and other legal action on the issue. It may also encourage a shift in the way antibiotic use is tracked – low-dose feed additives previously used for growth promotion might get reported as being used for illness prevention instead. I am doubtful that FDA’s guidance will result in a significant decrease in antibiotic use on livestock farms. Industry doesn’t seem worried about this guidance, but I believe that we would see vast industry push-back if a binding law was passed to truly limit low-dose antibiotics in animal feed/water. CDC couldn’t put it more plainly: Antibiotics should only be used to treat infections. Constant, low-dose administration for growth promotion or disease prevention in animals needs to cease. How will the stakeholders proceed in 2014? Mother Jones (Tom Philpott): Will Factory Farms Finally Have to (Gasp!) Get a Vet’s Approval to Use Antibiotics?